I apologize. I know it’s been awhile since I last blogged here, but things have been very quiet on my front. I totally skipped over blogging about my experience at Wizard World St. Louis Comic Con last month, as I was a little irritated they wouldn’t give me a press pass, so that’s really all that’s happened. Granted, I still had a wonderful time. Today, though, I have news! 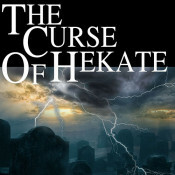 A new review over at Gabbing About Books has been posted for The Curse Of Hekate. And it’s a great one, too. So please go read it. Also, if you’ve read any of my books, please post a review somewhere of them. For many authors, reviews are our lifeline. You’ll be doing us a huge service by writing a review anywhere: GoodReads, Amazon, B&N, etc.